Wow, it sure has been awhile since we ate at Insadong. Despite its close proximity and generally reasonable prices, there were just other places to go. Yes, one of the biggest obstacles is their renowned crappy service and equally frustrating parking lot. I swear their service buttons are only for decoration... On the other hand, they do serve up decent eats in large portion sizes that continues to draw people in. 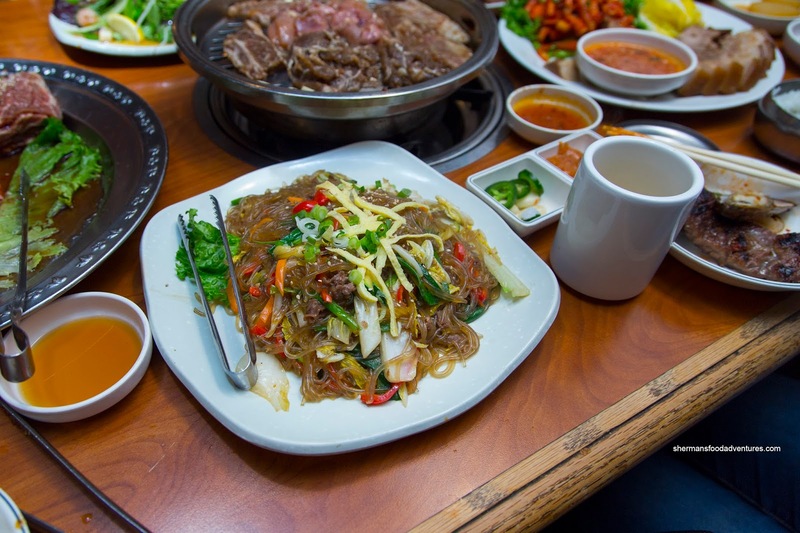 With that in mind, we ended up heading there since my daughter was craving Korean BBQ for her birthday meal. 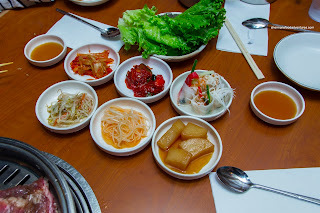 We decided on the Combo Meal for 4-5 people which included the usual Banchan. We liked that our favourites were all there including the stewed potato, bean sprouts, kimichi, pickled daikon and cucumber kimchi. I thought the potato was pretty balanced, not being too sweet, but it was undercooked. Too tart for our liking, the kimichi was only mildly spicy. The combo also included a pickled daikon roll which was crunchy and tangy. 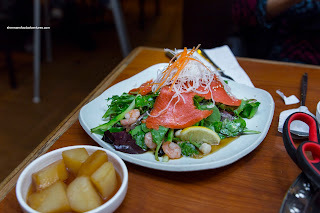 Topped with smoked salmon and little bits of seafood, the Seafood Salad was actually quite good. The greens were fresh and the dressing was bright, sweet and acidic. 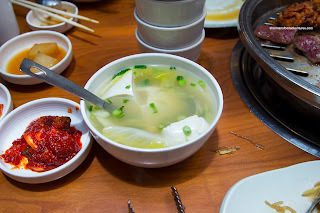 Interestingly, our Tofu Soup arrived when we were well into our meal. It was mild-tasting with big chunks of soft tofu. 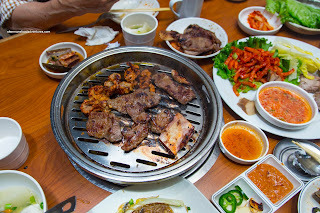 Onto the main event, we had a selection of Marinated Meats including both types of short ribs, beef, spicy pork, chicken, mussels and shrimp. I found the meat quality to be quite good especially the short rib as it was nicely marbled and when cooked, was buttery and tender. The spicy pork had a sweet kick while not being overly fatty. However, I felt that the marinade for the rest of the meats was pretty aggressively where things were overly sweet. No matter, all was good when a scoop of rice, bean paste, raw garlic and jalapeno was combined into a wrap with the romaine lettuce. 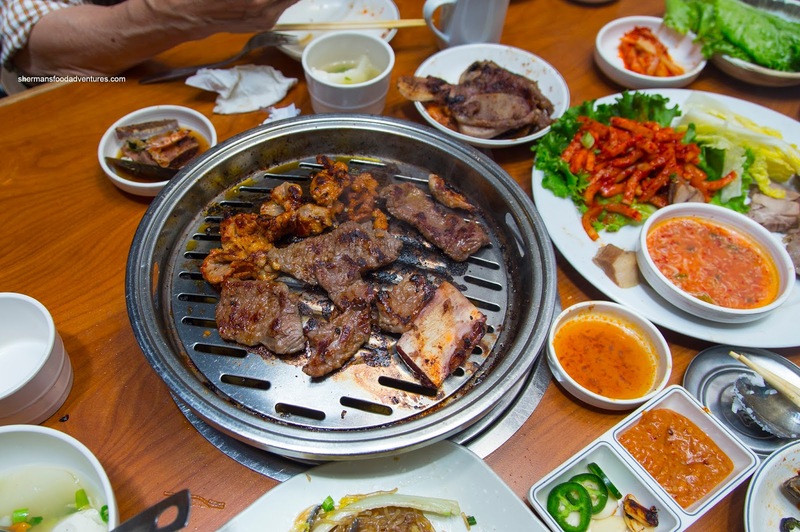 As if we didn't have enough meat already, we also ordered the Bossam. 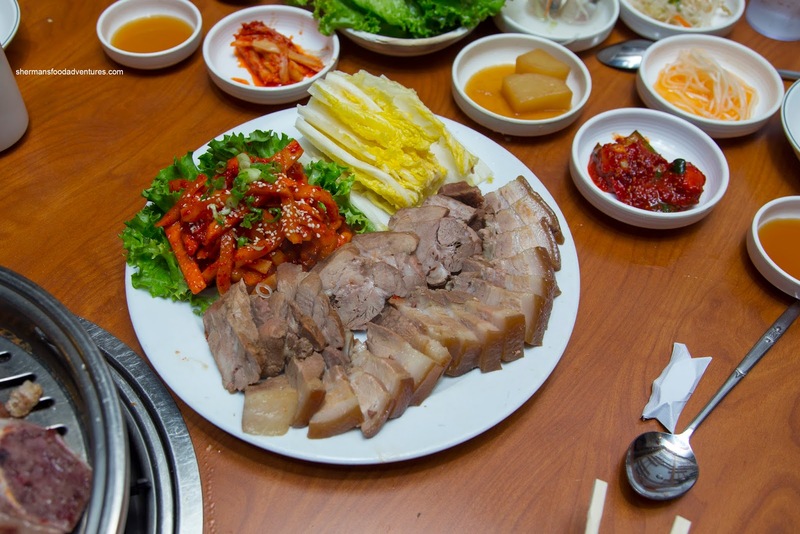 Sometimes, I find that pork belly for this dish to be fatty rather than gelatinous. This one was actually quite good being fairly lean, but there was enough gelatinized fat for a buttery texture. The pork belly was mildly seasoned on its own, but naturally, with the addition of the fermented shrimp sauce and spicy radish, it was pretty tasty. Back to the combo, an order of Bulgogi Japchae also included (but we had a choice between that and a pancake). I thought it was a bit wet where the noodles became too soft. It tasted good though being not too sweet and balanced in saltiness. Suffice to say, we didn't finish all this food even though we had 4 of us and the 2 kids. Generally, the food was above-average and as mentioned, the prices were reasonable.